You’re not sure what type of tank you should buy for your brewery or cider house? Do not worry about it. 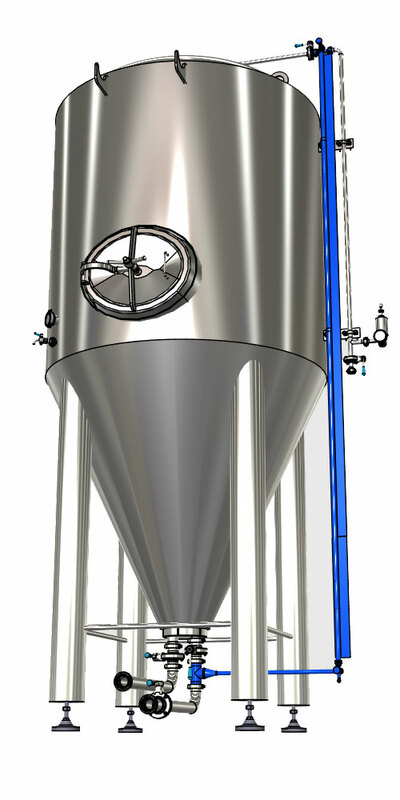 Take the modular cylindrical-conical tanks and assemble them in a configuration that you actually need. You can change a configuration of the modular tanks anytime. Tanks that adapt to your current needs. 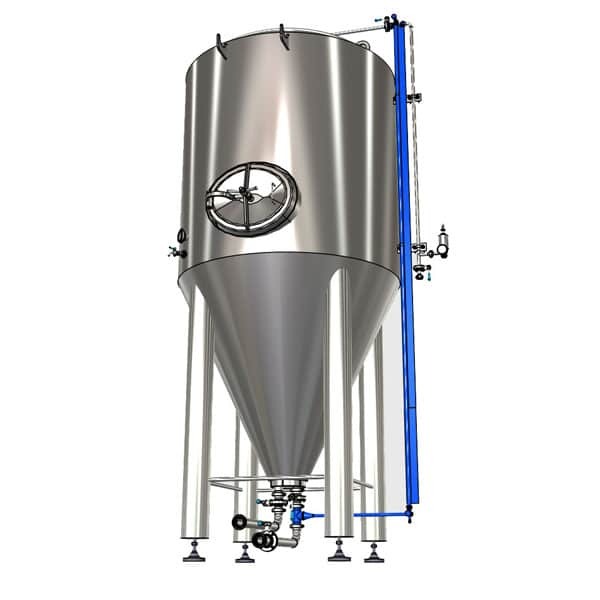 Modular cylindrically-conical tanks CCTM are very versatile products from our production portfolio that enable freely assemble the beer production tank to a configuration that is momentally required by user with respect to the intended use. That actual configuration of the tank can be changed at any time to any other configuration using expansion accessories and their combinations, even during full operation when the tank is pressurized and filled with beverage under pressure. CCTM modular cylindrical-conical tank consists of two main parts : The pressure vessel – basic tank (BT) and the accessories (MTA). Assembling tanks to many desired configurations is possible due to the big number of combinations of expansion accessory that is combined and mounted on the basic tank. It is thus possible to equip the modular tank optimal configuration for the desired part of the beverage production process. 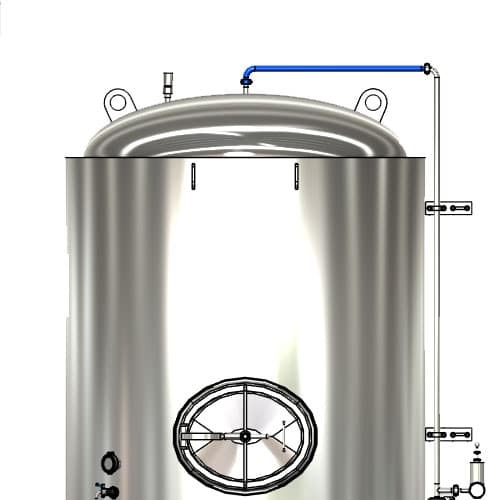 Pressure tank – maximum available pressure of 3.0 bar – suitable for main fermentation of all carbonizated alcoholic beverages like beer or cider, fermentation and maturation under pressure, carbonization, flotation, finishing and isobaric bottling of beverages into sale packages like glass bottles, PET bottles, steel kegs. SQ – standard quality – SB Ra<0.8μm : grinded inner surface of the cylindrical part, SJ Ra<0.5μm : polished inner surface of the conical part. External steel jacketes with all riveted connections and grinded surface. HQ – high quality – SJ Ra<0.5μm : polished all internal surfaces, polished welds. External steel jacketes with all welded connections and grinded surface. TQ- top quality – SJ Ra<0.5μm : polished all internal surfaces, polished welds. External steel jacketes with all welded connections and polished surface. MTA additional armatures are optional accessories for equipping of the basic tanks. The required configuration of the modular tanks is reached by equipping the basic tank with appropriate combination of additional armatures. There is possible to assembly the CCTM modular tanks in more variants. We recommend to choose one of these five pre-configured sets. Their descriptions, features and advantages are described bellow. The simpliest set of the CCTM tank that allows all phases production of beer, cider, wine, must, lemonades, including carbonizated isobaric beverages. LP version – If the tank is equipped with the 0.5 bar safety valve (non-pressure vessel according to the PED 2014/68/EU European directive), then the tank is available for non-isobaric production non-carbonizated beverages like wine, must, lemonade), but also for the main fermentation process during beer or cider production (not for maturation process that requires a higher pressure). Equipment of the tank allows to set required overpressure in the tank using the relief valve and to read current pressure on the manometer. 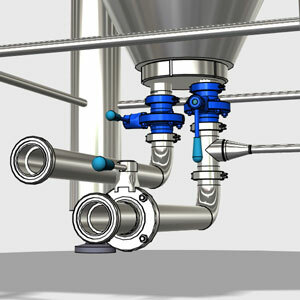 The fermentation process is indicated due bubbles that go throuhg water in the cap of the relief valve set. 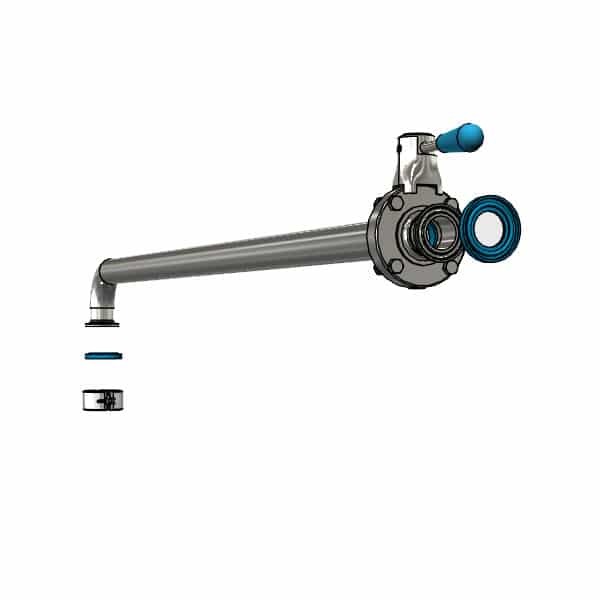 The tank includes a fixed or rotational spray ball and all pipes and valves that are needes for easy cleaning and sanitizing of the tank, ideally with use the CIP station. A sample valve allows a sampling collection. 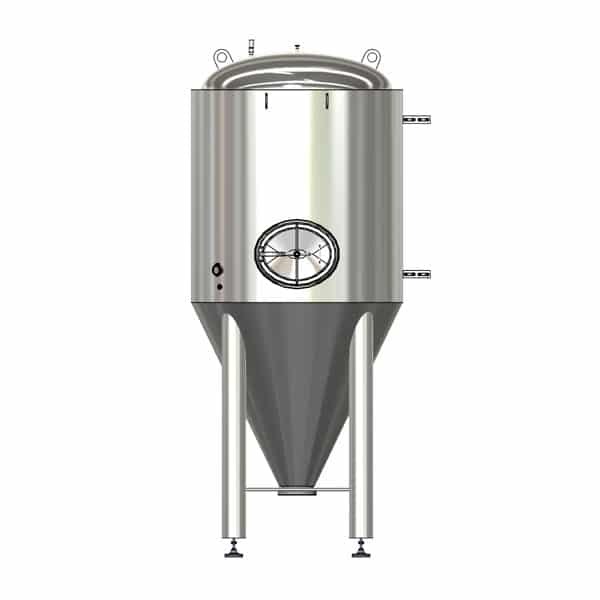 There is possible to add to tha tank also a carbonation equipment, dry hopping equipment or a flotation machine for puring of fruit must. 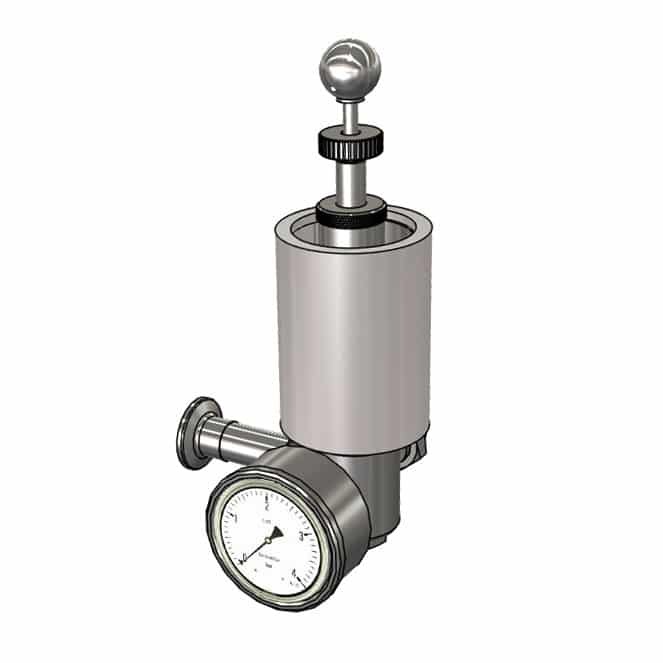 A filling level indicator is not included in this set because this accessory is not needed when the tank is used only for fermentation and maturation processes – the tank is usually empty or full. User of tank may not pay unnecessary care to cleaning and sanitizing of the filling level indicator. The tank does not include any long outlet pipes (DO1 and RO1 pipes )- they are usually problematic parts of most other types tanks where yeast stay in uninsolated place for longer time. These two things very eliminate the problem of rotting yeast, which are in uninsulated pipes often exposed to higher temperatures and they can negatively affect the quality of the product inside the tank. 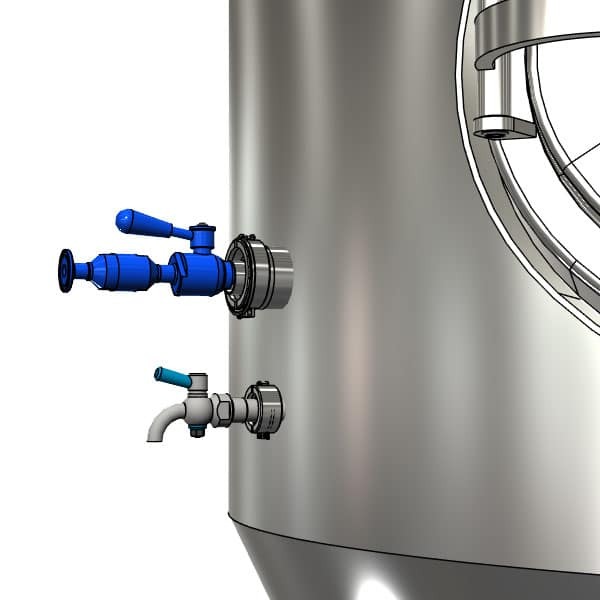 Thanks to its modular design it is always possible to add the filling level indicator to the tank later and to change this configuration to other one – only when the tank is empty. Differences between A1 and A2 : The tank with A2 configuration includes RO1 and DO1 arm-pipes. These additional pipes allow greater comfort in connection work when hoses have to be joined with the tank and when yeast has to be collected to the yeast storege tank. But there is cerntainly possible to disconnect the RO1, RO2 pipes for example to its cleaning. 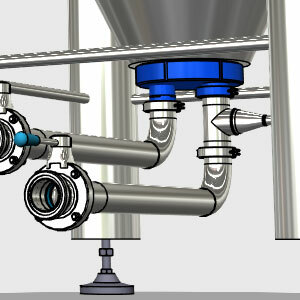 Connecting and disconnecting of the pipes may be done always when the tank is full – it is recommended before filling and draining the tank for ensuring absolutelly clean pipes before their contact with the beverage product. Position of flaps closest to the tank prevents unwanted rotting yeast in uninsulated arms. Similarly yeast cannot rot inside uninsulated pipes of the file level indicator because LIS level indicator is not included in this A2 configuration. The tank may be reconfigured to other configuration anytime – but only when is empty. 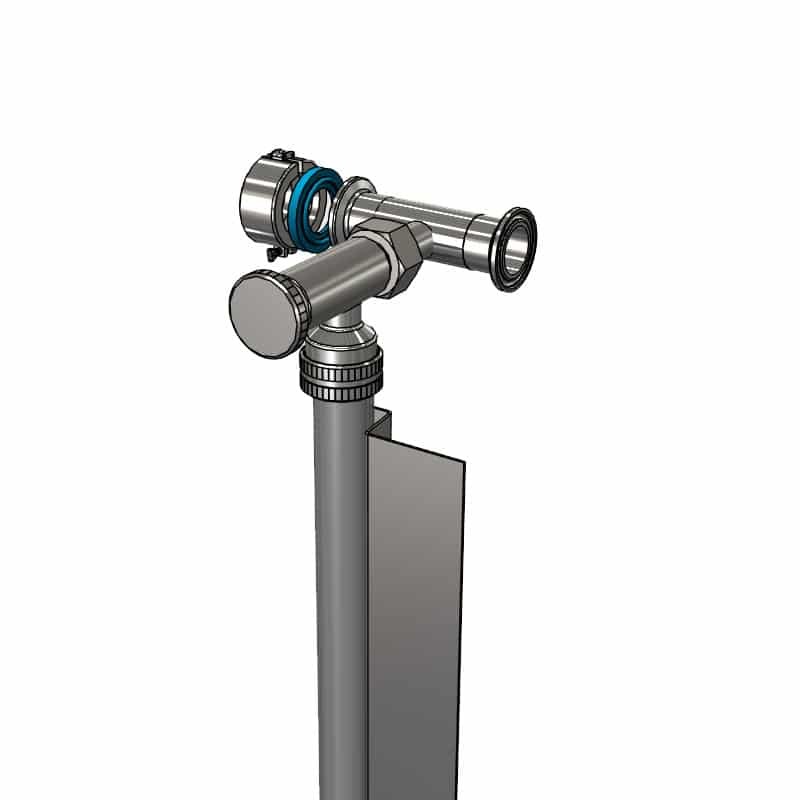 However if the CS1 upper sanitizing pipe with the valve is used, the fill level indicator may be added to the tank also when the tank is full and under pressure. Tank in A3 configuration differs from the A1 configuration by extended RO1, DO1 arm-pipes with flao-valves at their ends. These valves fully replace the RO2,DO2 flap-valves in A1- A2 configurations (which are located directly under cone of the tank). 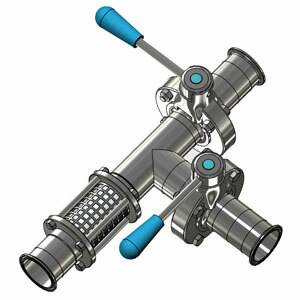 This position of both valves allows greater comfort during hose joining with the tank, draining and filling of the tank. There is not possible to disconnect both pipes when the tank is full, only when is empty. Unfortunatelly the location of flap-valves on ends of both pipes causes unwanted rotting yeast inside the uninsulated parts of the tank. Therefore we don´t recommend this configuration, if these tanks are placed in a room with temperature much higher than is inside the tanks. 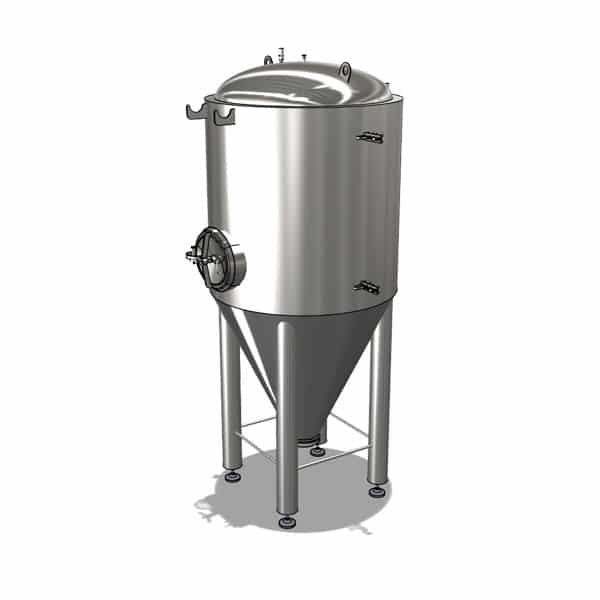 In contrast, it is a solution that is common on most fermenters from other manufacturers of fermenting tanks and therefore this configuration may satisfy a number of beverage producers. All problematic unwanted features of the A3 configuration are easy solvable – we recommend to order (or re-build later) the modular tank in the A1, A2 or in the best B2 configuration . The tank may be reconfigured to other configuration anytime – but only when is empty. The B1 configuration is very similar A3 configuration. 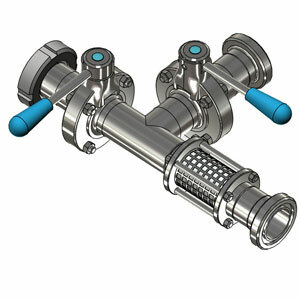 It also includes the RO1,DO1 arm-pipes with flap-valves for easy joining hoses and easy handling with the valves. The position of the valves is better for yeast collection from the tank too. In contrast, the B1 set is equipped also with the LIS fill level indicator as standard accessory. This makes it possible to monitor the actual level of beverage in the tank. 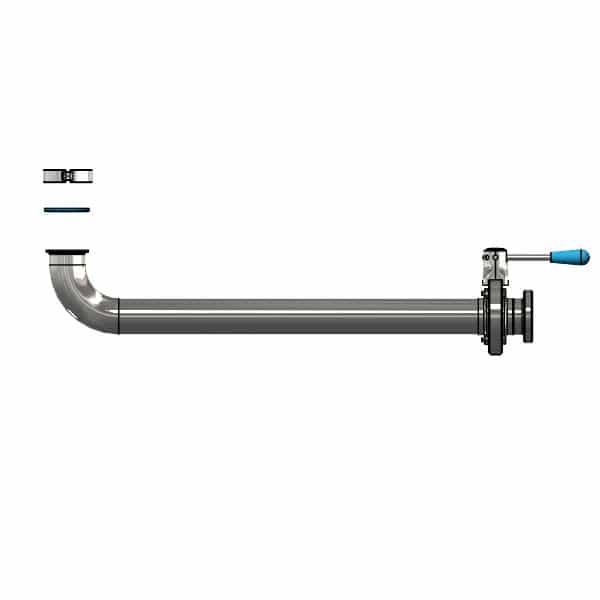 The fill level inficator is fully sanitizable – it is equipped with two valves for easy draining the glass pipe. It is possible also when the tank is full. The LIS fill level indicator cannot be disconnected when the tank is full. It is possible only when the tank is empty. Similarly there is not possible to disconnect or sanitize the RO1,DO1 pipes when the tank is full. Unfortunatelly the location of flap-valves on ends of both pipes RO1 and DO1 causes unwanted rotting yeast inside the uninsulated parts of the tank. Therefore we don´t recommend this configuration, if the tanks are placed in a room with temperature much higher than is inside the tanks. 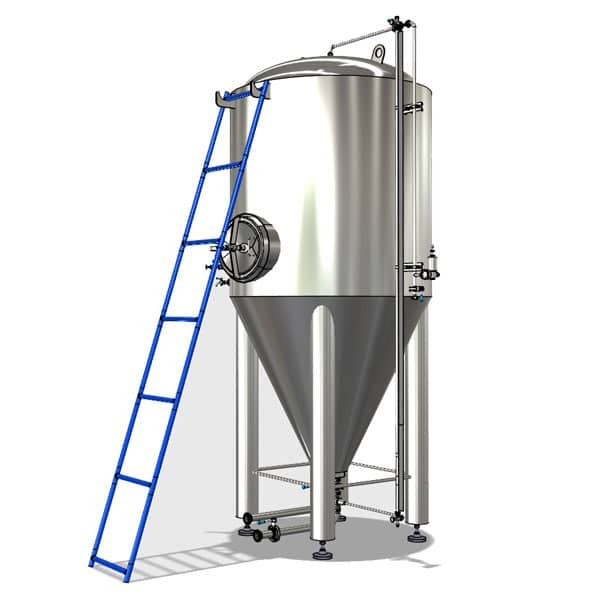 In contrast, it is a solution that is common on most fermenters from other manufacturers of fermenting tanks and therefore this configuration may satisfy a number of beverage producers. All problematic unwanted features of the B1 configuration are easy solvable – we recommend to order (or re-build later) the modular tank in the best B2 configuration . The highest configuration B2 presents the tank with equipment that allows you fully exploit all advantages of our CCTM modular tank system. The LIS fill level indicator is included as standard accessory of the tank. It is advantage mainly when the tank has to be used for finalizing of a beverage production – bottling, filling beverage to kegs, pumping beverage from the tank to a pub, filtering etc. 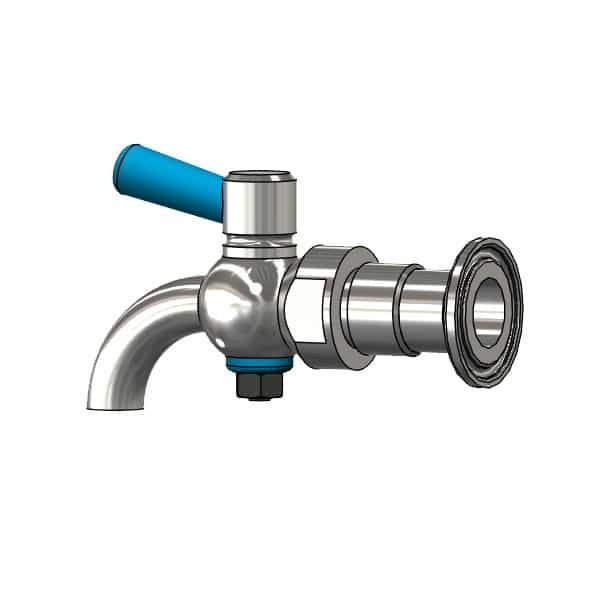 The CS1 upper sanitizing pipe is equipped with the flap-valve, bottom arm-pipe includes two flap-valves. One just below the cone and one on end of the arm. 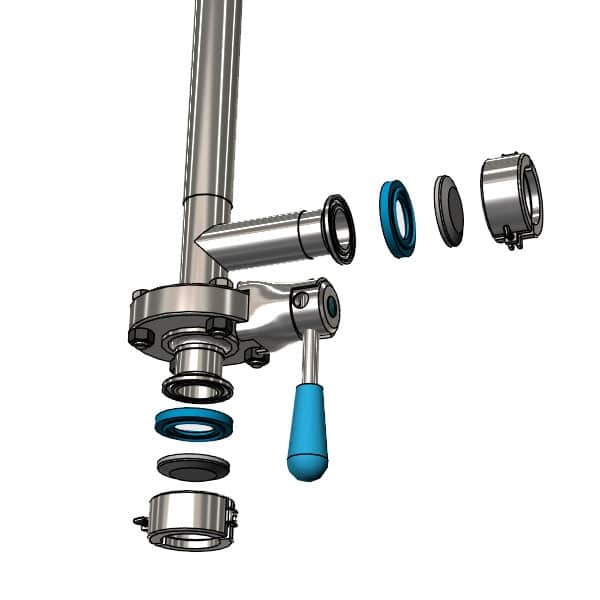 This assembly enables whenever hermetically separate the fill level indicator from the pressure vessel, then to clean and sanitize all pipes of the level indicator and also the bottom beverage product pipes and valves. It is possible when is the tank empty or also when is full. Without the disconnecting of any parts from the tank. Location of the flaps on the ends of the two lower pipes just below the cone prevents putrefaction yeast in long uncooled lower arms of both bottom pipes. Described features ensure the great possibility of keeping all problematic fitting always sterile. 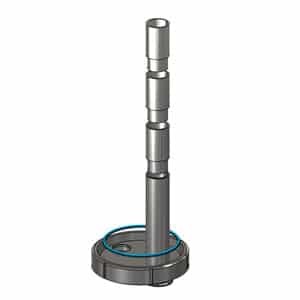 This prevents rotting yeast inside the level indicator and also in the product filling-draining pipes. Therefore there can not occur undesired inner infection of the product. You can choose between two types of TO1 bottom filling-draining disc : with fix beverage input/output pipe (non-segmented) or with variable beverage input/output pipe (segmented). Fix bottom filling-draining disc TO1FIX – the pipe for filling and draining of pure product has a fix length. Customer may customize the length of the pipe (to cut to be shorter) as is needed, according of expected height yeast level in the tank. 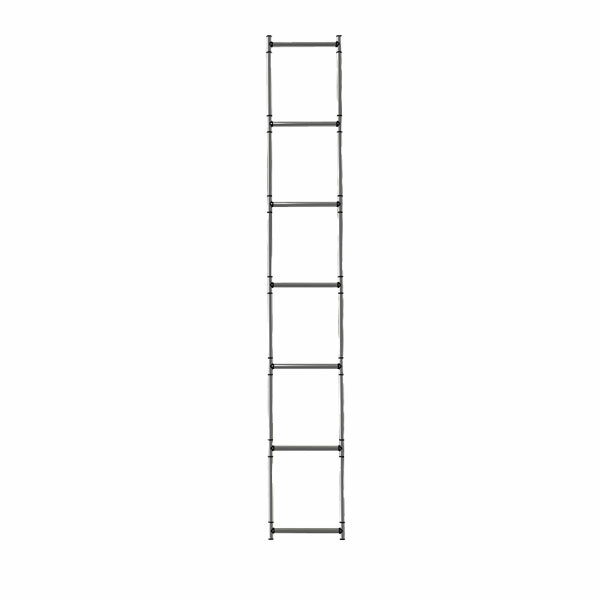 Standard accessory of A1, A2, A3, B1 sets. Optional accessory of B2 set. Variable bottom filling-draining disc TO1VAR – the pipe for filling and draining of pure product has a variable length because it is segmented. 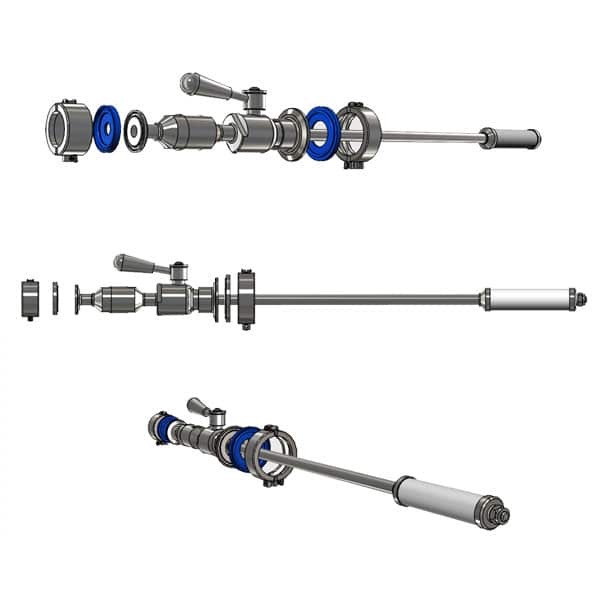 Customer may customize the length of the pipe without cutting only by adding segments to the disc, according of actual height yeast level in the tank. Standard accessory part of B2 set. Optional accessory of A1, A2, A3, B1 sets. By selecting the number of segments of the product pipes can be optimally utilize the maximum capacity of the product based on the current amount of yeast in the tank. 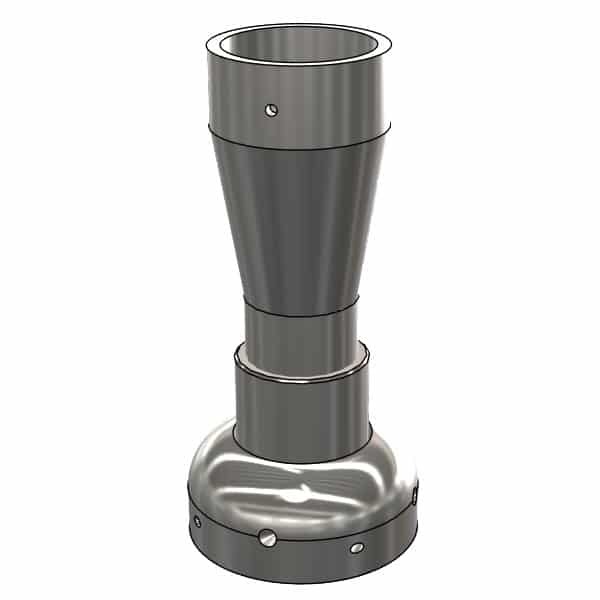 This reduces the loss of beverages that occur in other tanks with conventional concepts (because there is never possible to get a beverage under the upper product pipe throat). Why to decide for modular cylindrical-conical tanks? Modularity means customer´s freedom while deciding about his purchase. The customer can order tank with cheaper limited configuration (e.g. without level indicator, without the possibility of sanitation of the sludge armature, without carbonation candle, etc.) and buy additional armatures later in case of need. For keeping the ability of this option, we always consenquentially archive technical drawings of produced tanks. 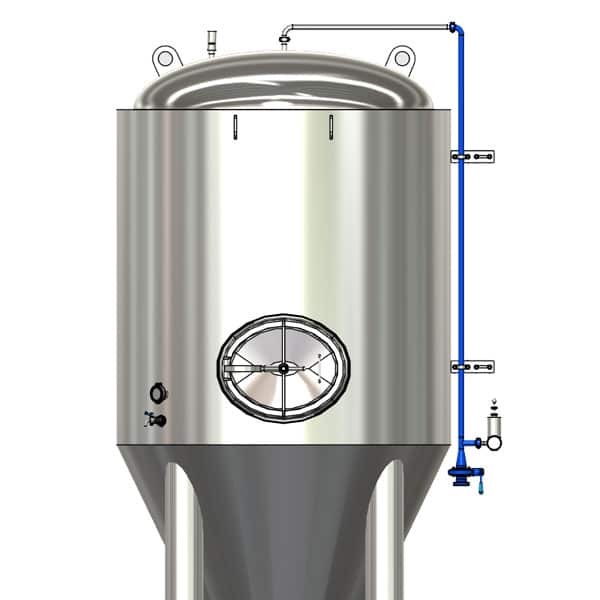 The possibility of configuration of tanks with or without the level indicator. . CC tanks are usually used in full-empty mode if they are used only for fermentation and maturation of the beer (or other product). In this usual mode, the level indicator is inefficient complication for the brewmaster because the yeasts decay in it and the beer can get an infection. For ensuring maximal sterility of the beer, most of brewmasters preffer configuraton without the level indicator. However, there are situation when level indicator is necessary. For example, if a control from board of customs is expected which require visibility of volume of beer in the tanks. Or when there is no bright beer tank and the beer is launched to the kegs or bottles right from the CC tank. 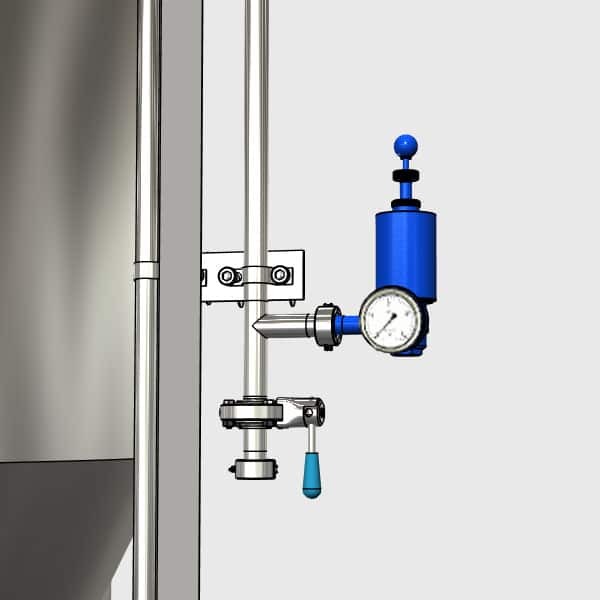 In such case, the level indicator can be attached additionally and that even when the tank is full and overpressured, without necessity of overdrawing the beer to another tank. The level indicator can be detached anytime as well. This is usefull mainly when the brewmaster needs to place the level indicator to another tank, to clean it or if it suddenly breaks. There is no risk of draining the product out of the tank. Preventing from rotting of beer in the sludge armatures. Contruction of the tank enables to sanitize , detach and clean the sludge armatures anytime, even when the tank is full. 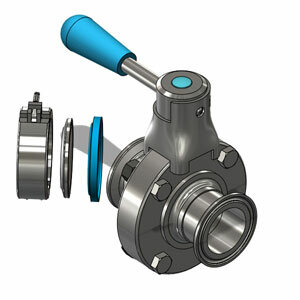 Thanks to the the possibility of placing the butterfly valves right under the cone, there is only very small amount of beer which is exhibited to the higher temperature and therefore the beer is prevented from rotting in the sludge armatures, unlike from usual CC tanks. It is not neccessary to drain beer from the tank to prevent from infection so there is not as many losses of beer as it is in usual CC tanks. Possibility of sanitation of the level indicator and sludge armatures without detachment during its operation. If the tank is equipped with armatures in full configuration, then it is possible to do sanitation of level indicator and sludge armatures without neccessity of their detachment even when the tank is full of beer and pressurized. That helps to prevent the beer from rotting in the level indicator and in the sludge armature without neccessity of its detaching and manual cleaning. The result is not-inficated beer in the tank equipped with level indicator and with randomly long sludge armatures which is impossible in usual tanks because they do not allow to sanitize level indicator and sludge armature when they are full of beer. 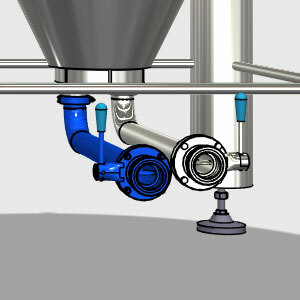 Possibility of installation optional armatures on the side of the tank – blinded armature on the left side of the manhole enables additional installation of carbonation candle or for flotation device (used for production of wine, cider, juices,…) or for so called Hop Extractor for dry hopping of beer. Armature is not basic equipment of the tank and if the customer needs to, we can produce it even without it because it is quite hard to be sanitized. It requires to be cleaned manually. Possibility of intallation of optional type of sample valve – small armature on the left side of the manhole enables additional installation of random type of sampling valve (e.g. with or without compensator of foaming). Armature is not basic equipment of the tank and if the customer needs to, we can produce it even without it because it is quite hard to be sanitized. It requires to be cleaned manually. 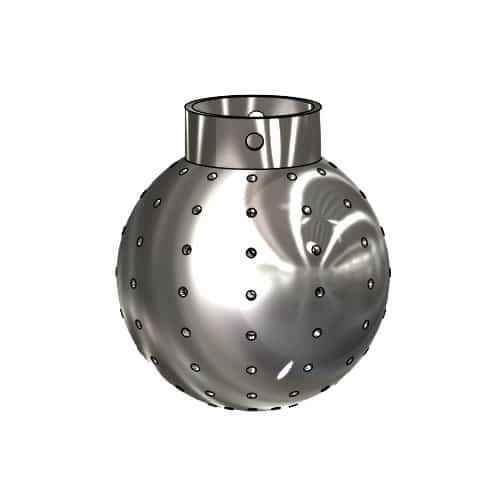 Possibility of choice of the type of sanitation shower – We offer several types of sanitation sprayball – fixed, rotating, multiple, with active sprayer, … Replacing of the shower type is very easy, thanks to cotter or thread. Possibility of choice of the bottom combined armature – We offer two basic types of bottom combined armatures which consist of union nut DN125-DN150, sludge and product pipe which are welded to the blinding disc. Simple armature wiht fixed product pipe which can be cut to the required length by the customer and modular armature with product pipe composed from several segments where the customer can choose required length of the pipe with accordance to the height of the level of the yeasts in the tank. Possibility of choice od connecting armatures TC/DC – We offer tanks and expanding armatures in two versions of connections – Triclamp and dairy coupling – both versions for the same price. Every European country has its own habits and standards. Some of our customers require DIN 32676 TriClamp, others DIN 11851 Dairy Coupling. Modularity enables to use also reductions for optimizing both of the standards. Safe transport and manipulation with the tank – thanks to detachable armatures, the tank is exposed to much lower risk of damage, compared to the tanks with welded armatures. This decrease the requirements for packaging and transporting material, tanks take less place during the transport, the risk of damage is decreased and therefore also financial and time losses with following complaints. Generally, the packaging and transport are cheaper with less risks. Modular conception of tanks is simply advantageous – It is a fact that significant part of our customers preffes modular conceptions of our devices. Modularity enables to change attributes of the product with accordance to the customer´s needs and enables to expand its options over the frame of originally intended purpose. 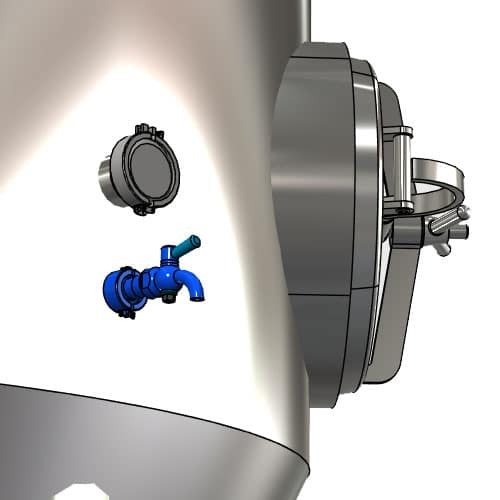 We recommend to use CCT-M tanks so, that the level indicator is hermetically divided from the tank by the closed valves during the filling and also during the whole proccess of fermentation and maturation. When the proccess of maturation is finished, the level indicator can be opened and filled. Then you can check the level of the product on the level indicator during filtration or during draining to the kegs or bottles. This prevents the product from infection from yeasts rotting in the non-cooled armatures and level indicator.